Introduction: Rhinoliths are uncommon nasal masses. They are mineralized masses found within the nasal cavity. They have various clinical presentations. Case Presentation: We report a 13-year-old boy with long-standing nasal obstruction, yellowish nasal discharge and intermittent and minimal nasal bleeding for a few weeks, who had been treated as rhinosinusitis twice. Due to the presence of long-standing symptoms, a systematic nasal examination including anterior rhinoscopy and nasal endoscopy was carried out. Nasal endoscopy revealed a whitish irregular mass along the floor of the nose at left inferior meatus. Computed tomography (CT) scan of paranasal sinuses showed a hyperdense substance in the floor of the left nostril. Rhinolith was removed endoscopically under general anesthesia, leading to the complete resolution of his symptoms. Discussion: Diagnosis of rhinolithiasis can be made by keeping a strong suspicion based upon history and symptoms. The current case report shows the importance of rigid nasal endoscopy and radiological assessment in diagnosis and management of rhinoliths, particularly if they are situated posteriorly. Rhinolith is of Greek origin; “rhino” meaning nose, and “lithos” meaning stone. Rhinoliths are very uncommon (1). They are mineralized masses found within the nasal cavity (2). In the review of literature, some authors have noted that they are generally seen in the anterior part of the nasal cavity, while others believe that the most prevalent site of rhinoliths is the middle of the lower nasal cavity (2). Those which are located in the anterior part of the nasal cavity are generally diagnosed on history and anterior rhinoscopy (2). Nasal endoscopy can be a great help in posteriorly situated rhinoliths (3). Radiology can also be helpful in posteriorly located masses, which may be responsible for difficulties in diagnosis (4). We report a case of posteriorly situated rhinolith in a boy who was diagnosed with the help of a rigid nasal endoscopy and CT scan of paranasal sinuses. The aim of the current case report is to show the importance of rigid nasal endoscopy and radiological assessment in diagnosis and management of rhinoliths, particularly if they are situated posteriorly. A 13-year-old boy was presented to otorhinolaryngology clinic of University Malaya Medical Centre with complaints of intermittent nasal bleeding, long-standing nasal obstruction, and purulent nasal discharge since a few weeks prior to admission. He did not provide any history of putting a foreign body inside the nose. There was not any history of trauma, systemic disease, or constitutional symptoms. The patient was treated as bacterial rhinosinusitis with Augmentin (amoxicillin-clavulanate) 625 mg q12h for two weeks, topical decongestant, nasal irrigation with normal saline, and analgesics. He was seen two weeks later by another specialist. Due to the persistence of symptoms and the presence of mucopus in the left nostril on anterior rhinoscopy examination, cefuroxime 500 mg q12h, metronidazole 500 mg q8h for two weeks, and cetirizine 10 mg once daily were prescribed for him. He was also sent for computed tomography (CT) scan of para nasal sinuses. The patient was seen at the clinic six weeks later. He was still complaining of runny nose. On the anterior rhinoscopy examination, the left inferior turbinate was congested. Nasal endoscopy examination revealed congestion of the left inferior turbinate and a whitish irregular mass along the floor of the nasal cavity at the posterior part of the left inferior meatus. CT scan showed an irregular mass, situated posteriorly along the floor of the left nostril (Figure 1). Based on clinical and radiological presentations, patient was diagnosed with rhinolithiasis of the left nostril. The rhinolith was crushed and removed endoscopic ally under general anesthesia. A screw that was the nidus of rhinolithiasis was also removed from the left nostril (Figure 2). The patient had an uneventful recovery and was seen two weeks later at clinic. A) coronal plane; B) axial plane. Rhinolithiasis was first described by Thomas Bartholin, Danish physician, in the 17th century (1, 2, 5). Since then, hundreds of cases have been reported in the literature (5). The rhinolithiasis incidence reported in the literature has been relatively rare; about 1 in 10,000 otorhinolaryngology patients. The usual age range for diagnosis of rhinolithiasis is between 8-25 years old with female predominance (2, 5). The pathogenesis of rhinolithiasis is not clear (2). Rhinoliths originate from the deposition of magnesium, iron, calcium and phosphorus around a nidus, which can be endogenous or exogenous (1, 2). The exogenous nuclei that are more prevalent include significantly different foreign bodies, placed in the nasal cavity generally during childhood. Children are interested in exploring their bodies and thus more prone to lodging foreign bodies in their nasal cavities or ear canals. Nasal foreign bodies can also be seen in adults, particularly those with mental retardation or psychiatric illness. The presence of foreign body leads to a local inflammatory reaction. Salts and minerals deposit around the core subsequently. The endogenous nuclei include intranasal thick secretions, epithelial debris, blood clots, bone fractures of visceral skull, and ectopic teeth (1, 2). A screw was the nidus of rhinolithiasis in this case report. The patient did not have any psychiatric problem and therefore he had probably inserted the foreign body in his nasal cavity when he was younger. The first chemical analysis of rhinolith was performed by Axmann in 1829. The main materials (up to 90%) are inorganic, such as calcium phosphate, calcium carbonate and magnesium phosphate, as well as other rare substances. The organic components may be derived from nasal secretion and lacrimal fluid (2). Rhinoliths are generally seen in the floor of nose, about halfway between the anterior and posterior portions of the nasal cavity (5). In the literature review, some believe that rhinoliths are situated in the anterior half of the nares. Small rhinoliths are generally asymptomatic. Larger rhinoliths can lead to unilateral nasal discharge, nasal pain, swelling, sinusitis, or remain asymptomatic (1, 2, 5). Erosions of the septum, maxillary sinus, and perforations have also been mentioned in the literature (5). They present as greyish irregular masses and feel hard, bony and gritty on probing (5). In many patients, the diagnosis accidentally follows other radiological examinations. The most important differential diagnoses of rhinolith include tori, impacted teeth, mycolith, odontoma, granulomatous diseases (syphilis and tuberculosis), osteoma, enchondroma, calcified polyps, haemangioma, dermoid, nasal polyp with osseous metaplasia, osteosarcoma, and chondrosarcoma (2, 5, 6). The complications reported are rhinosinusitis, septal and palatal perforations, recurrent otitis media, and dacryocystitis (2). The radiological manifestations of rhinolith were first described by Maclntyre in 1900 (5). The typical radiological features of rhinolith are radio-opacity with central translucency. On CT scan, it presents as a homogenous, high density lesion with smooth mineralization. 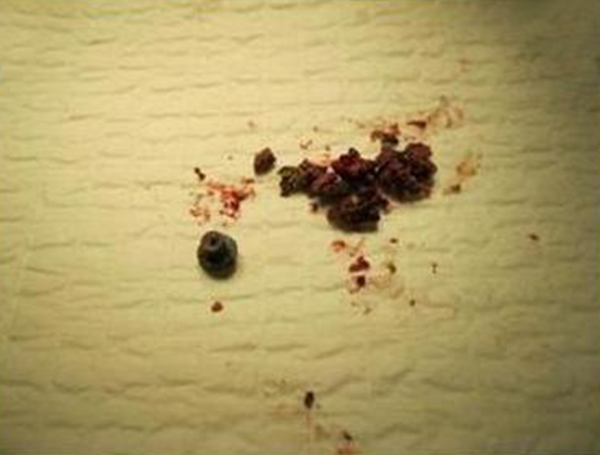 The central portion of the lesion may contain organic materials with probably a lower density or a foreign body (2, 5). CT scan of paranasal sinuses can precisely determine the site and size of rhinolith and recognize any coexisting sinus disease which will probably require treatment (4). Rhinoliths may be asymptomatic for many years until the continuous growth of rhinolith cause nasal obstruction, and maybe frequently misdiagnosed as rhinosinusitis, as our case. Although a number of cases have been reported, rhinolithiasis remains a relatively rare clinical entity and misdiagnosis can happen because of the failure to detect rhinolith in the anterior rhinoscopy. Rigid nasal endoscopy plays an important role in making a diagnosis and evaluating the posterior extent of a rhinolith without being exposed to radiation (2). In the majority of cases rhinolith can be removed endoscopic ally, except for rare cases that will require extended surgical approaches such as lateral rhinotomy for complete removal of the stone (2). Surgeons can utilize lithotripsy to disintegrate the rhinoliths that cannot be removed surgically (4). The main challenging aspect of this disease is misdiagnosis with more common diseases such as rhinosinusitis. Our case was a unique one in regard to an incorrect diagnosis twice by specialists because of vague history and an incomplete physical examination. 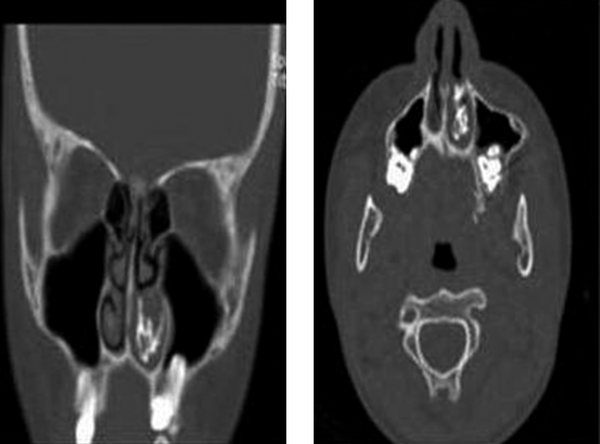 The current case report stresses the importance of considering the possibility of rhinolithiasis in unilateral nasal obstruction and nasal discharge to prevent misdiagnosis and delayed diagnosis. In conclusion, the diagnosis can be made by keeping a strong suspicion based upon symptoms, history of putting foreign body into the nose, physical examination, and complementary tests. The examination should include anterior rhinoscopy and rigid nasal endoscopy (1). Radiological assessments including simple X-ray and paranasal CT scan support the diagnosis by showing calcified concentrations in the nasal cavity and would be a great help in planning surgical approaches (1). Authors’ Contributions: Acquisition of clinical data, reviewing the scientific literature, drafting of the manuscript and critical revision of the manuscript for important intellectual content: Hadi Sharouny. Study supervision: Rajagopalan Raman.